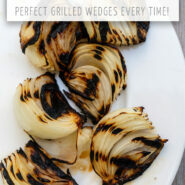 Break out the grill for summer and learn how to grill onions! 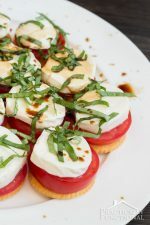 These are so delicious and the easiest side dish for all your summer nights. We love grilled onions in our household; whether they’re slices for sandwiches and burgers, or wedges for snacking on, grilled onions are our favorite summer grilling recipe! It’s super easy to cook onions on the grill, so today I’m going to show you the best way to grill onions in both slices and wedges! 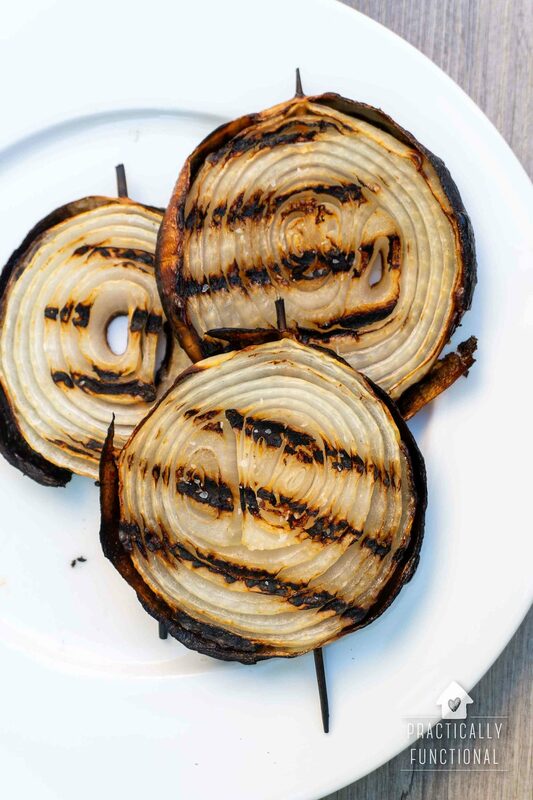 We have a gas grill, so that’s what the instructions in this grilled onion recipe are based on. 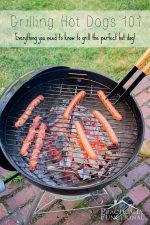 But if you have a charcoal grill, I share tips for grilled onions on a charcoal grill as well in the instructions below. 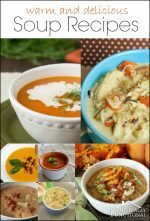 The printable version of the recipe is at the bottom of this post. For perfectly grilled onion slices for burgers or sandwiches you want to start with sweet onions (Walla Walla or Vidalia onions are the most common, but any sweet onion will do). Peel the skin and one outer layer off the onion, then trim off the top so you have a flat surface. 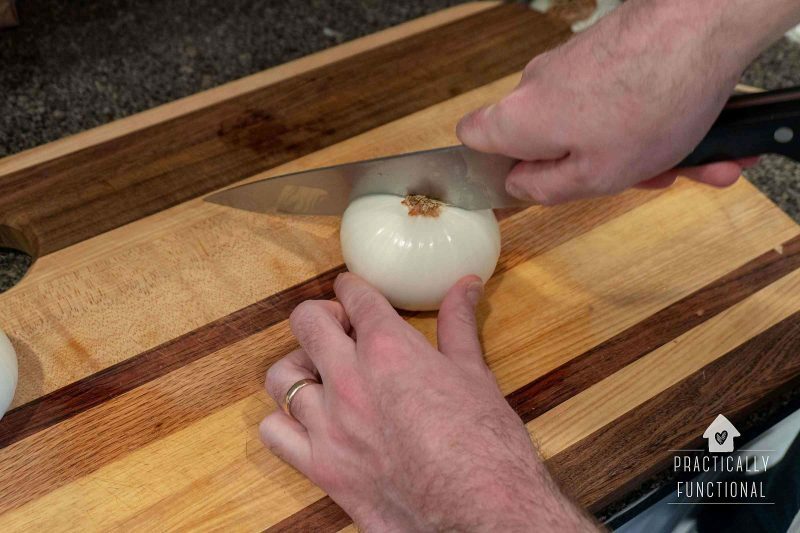 Push a wooden skewer all the way through the onion, about 1/4 inch from the flat surface you just cut. Make sure to push the skewer all the way through the onion so that only about an inch of the back of the skewer sticks out of the onion. Cut a 1/2 inch slice off the end of the onion so that the skewer is in the cut off slice. 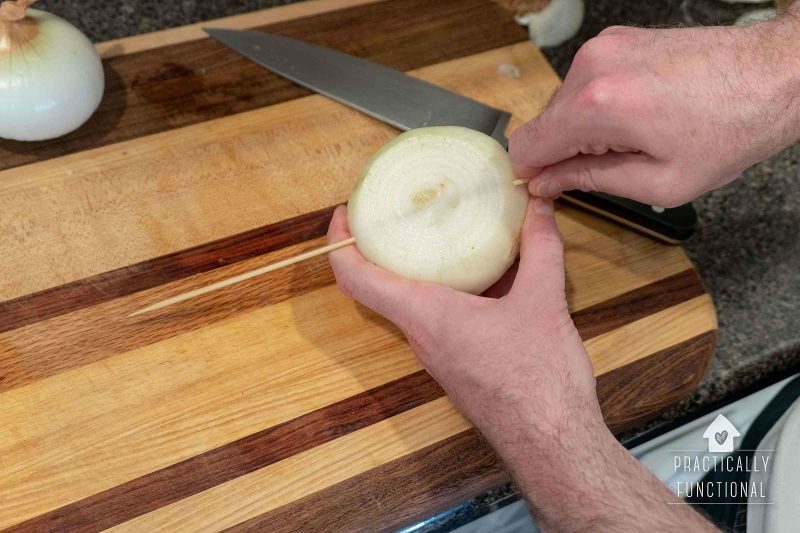 Then cut or break the skewer, leaving about an inch protruding from the onion. Then you can use the sharp half of the skewer to skewer the next slice of onion. 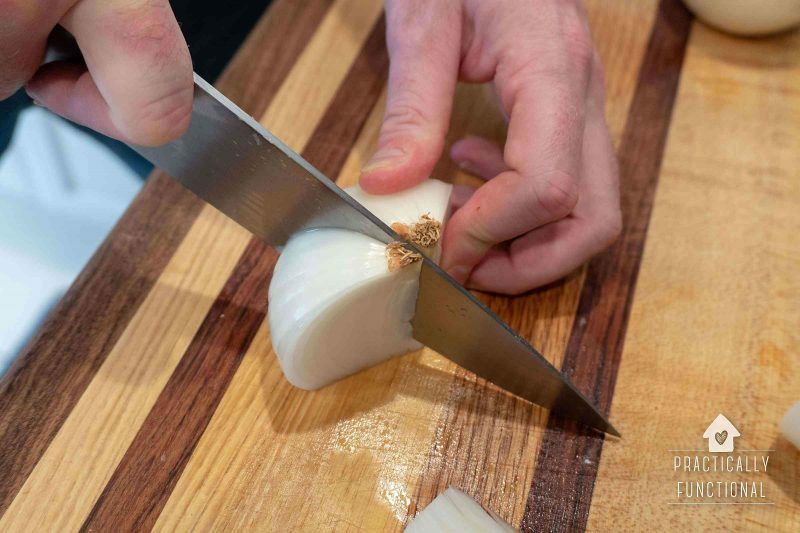 A large onion should yield 4-6 slices when sliced this way. Coat both sides of each slice in olive oil and a dash of salt. NOTE: We’ve never had a problem with the wooden skewers catching on fire while grilling, but if you’re worried about it you can soak the skewers in water for 15 minutes before prepping your onions so they don’t burn. 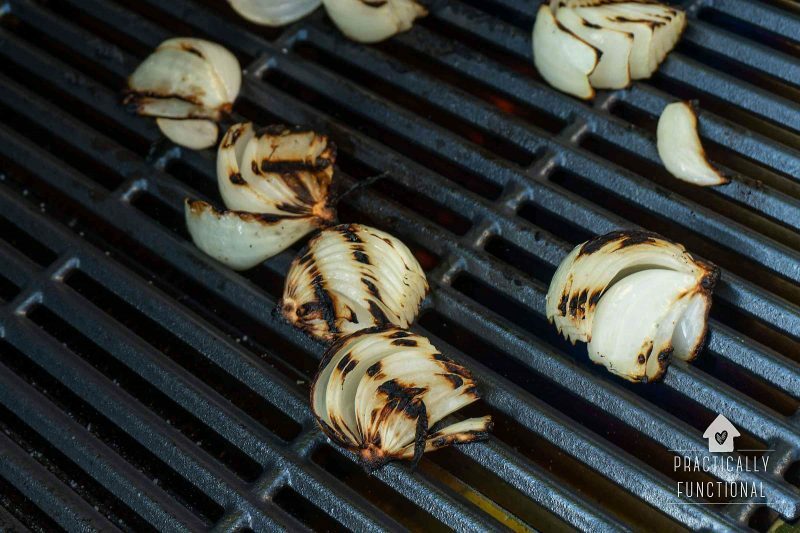 You want to use sweet onions for grilled onion wedges as well; the sugars caramelize perfectly on the grill to make delicious grilled onions! Place the onion flat side down and cut it in half, right through the root. Then cut each half of the onion into wedges, again slicing right through the root. The root will hold the onion wedges together so they don’t fall apart on the grill. A large onion should yield 6-8 wedges when sliced this way. Coat the wedges in olive oil and a dash of salt. 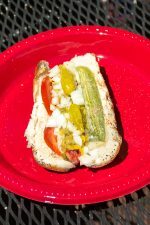 Preheat your gas grill for about 10 minutes, then turn the heat down to medium. You want to cook the onions on a medium heat so they can cook for longer (and get caramelized!) without too much charring. If you like your onions a little softer and more caramelized, lower the heat and cook them a little longer. If you like your onions just gently charred, but still firm, you can increase the heat so the outside of the onions will cook faster. For a charcoal grill, start your coals, then when they are ready, pile them all the way to one side of the grill to create a tall hill of heat. 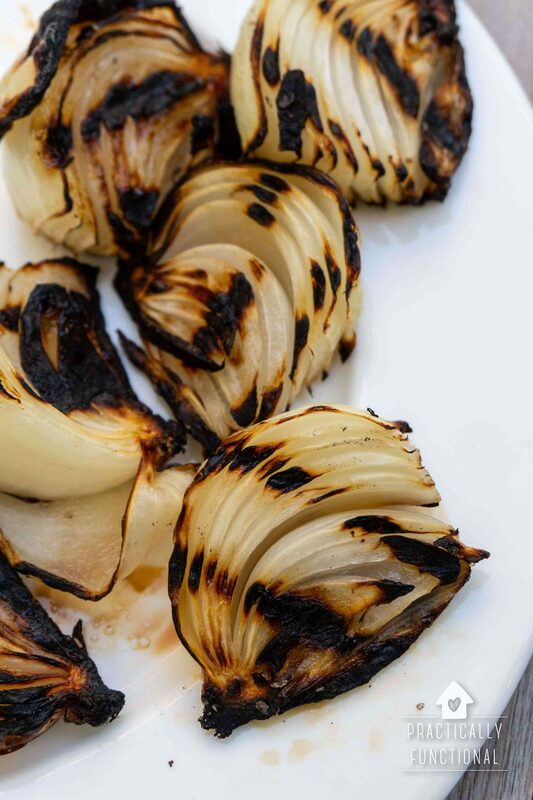 When the grill is ready, put the onions on the grill. (For a charcoal grill, put the onions on the opposite side of the grill from the hill of coals.) 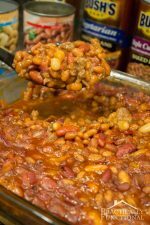 Cover and cook for 10 minutes and then flip them over. Cover and cook again for 10 more minutes. 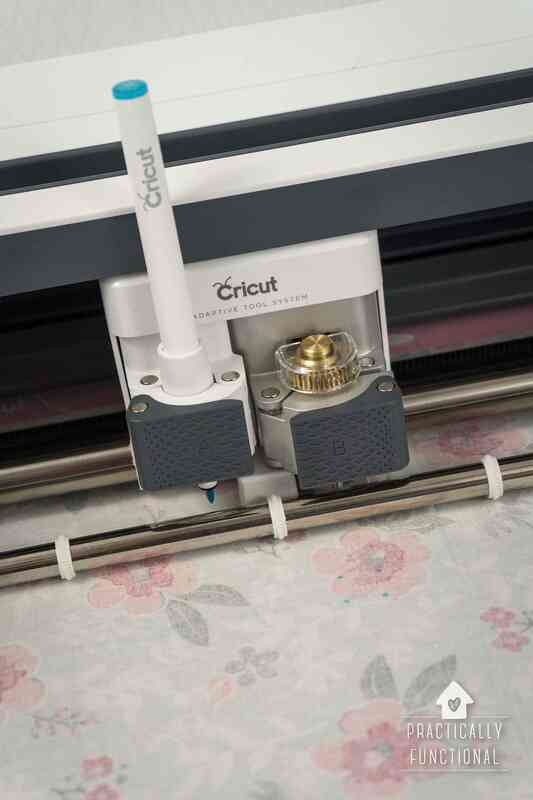 Keeping the grill covered is important because it will help the center of the onion cook as well as the outer surfaces. 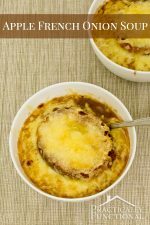 The onions are done when they have a light golden color on all sides. You can pull them off the grill after the first 20 minutes, or flip them one more time and cook a little longer if you want them more caramelized and brown. The onions should be done after 20-40 minutes, depending on how soft/caramelized you want them. 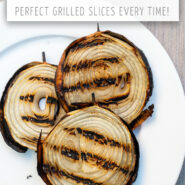 Learn how to get perfectly grilled onions every time, whether you want them in slices for burgers or sandwiches, or in wedges for snacking on! 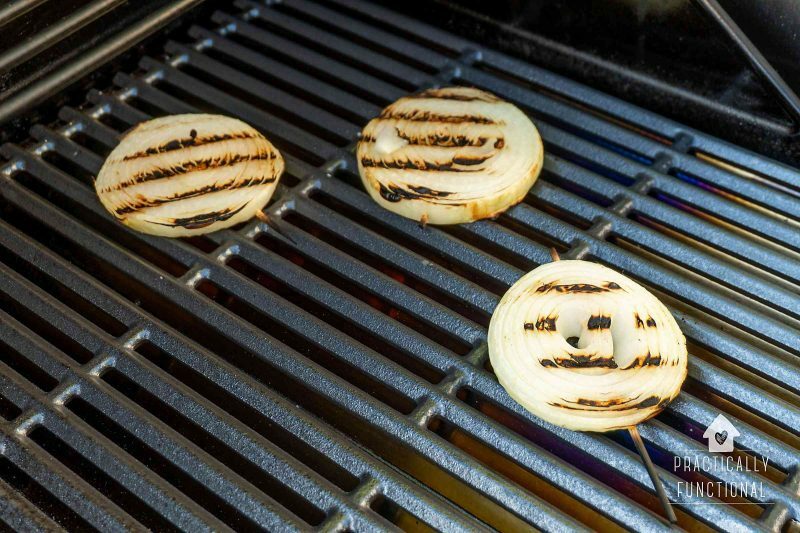 This grilled onion recipe will show you the best way to grill onions on a gas or charcoal grill. Peel the skin and outer layer off the onion, then trim off the top. 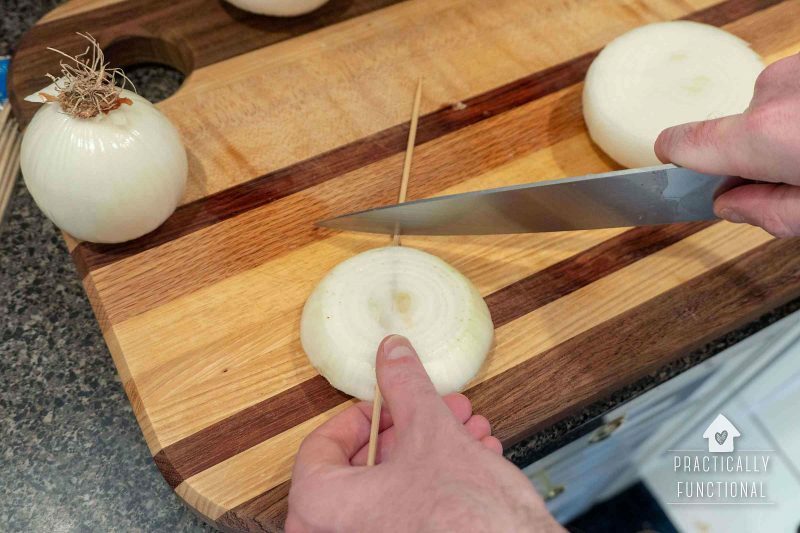 Push a wooden skewer all the way through the onion, about 1/4 inch from the flat surface you just cut. Cut a 1/2 inch slice off the end of the onion so that the skewer is in the cut off slice. Cut each half of the onion into wedges, again slicing right through the root to hold it together. 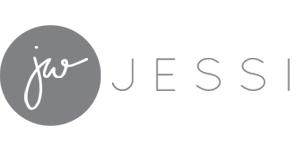 Preheat your gas grill for about 10 minutes, then turn the heat down to medium. Start your coals, then when they are ready, pile them all the way to one side of the grill to create a tall hill of heat. Cover and cook again for 10 more minutes. Flip every 10 minutes, keeping the grill covered, until done. Onions are done when light golden in color, about 20-40 minutes depending on how soft/caramelized you want them. If you like your onions a little softer and more caramelized, lower the heat and cook them a little longer. If you like your onions just gently charred, but still firm, you can increase the heat so the outside of the onions will cook faster.